A few months ago, I was sat in front of my laptop in my dining room/makeshift design studio and in the middle of schedule some tweets I froze and then burst into tears. Very dramatic, I know. I couldn’t carry on with work, I felt down and miserable and I could feel myself getting ill. I had just completed a design project which had been drawn out for months, I was also in the middle of creating logo concepts for two clients and websites for two different clients. On top of client work, I was desperate to create some free content to build my email list, write two blog posts a week, schedule my social media two weeks in advance and hit the glorious stage of inbox zero. All of this had led to 12 hour days and working weekends. For those that guessed it, yep, I was suffering from Burnout with a capital ‘B’. Underneath all the pressure of a creative entrepreneur to keep up with my client work as well as everything else that comes with the job, I had caved and let it get on top of me. The problem with Burnout is that most of the time, you don’t know you’re going through it until it has become too much and it is too late to claw back to the world of happy business owner. But that doesn’t mean it should ruin your business or disrupt your happiness. I have four easy steps which helped me go from Burnout to Bliss in no time at all so you can get back to running your business and living your dreamy lifestyle. 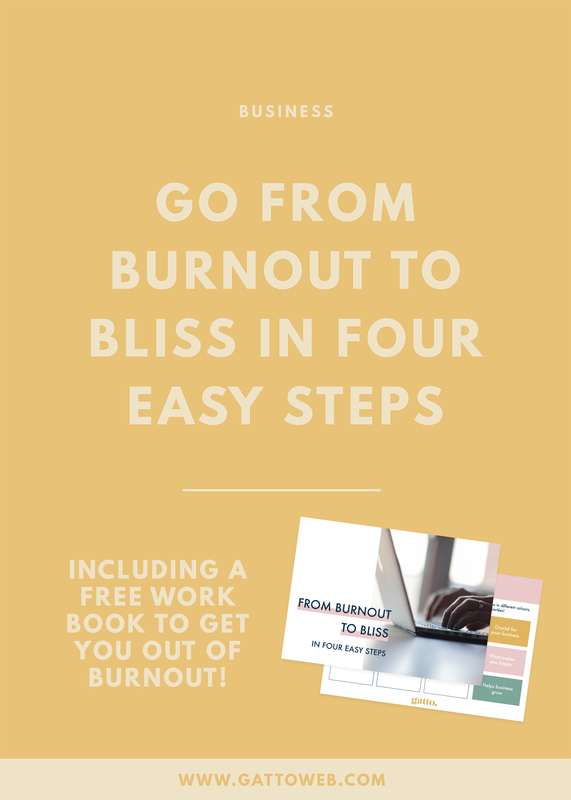 Sign up to the Gatto newsletter to get your hands on the Burnout to Bliss workbook. Head to your email for access to the Workbook and all other FREE resources! Burnout happens for one main reason. You’re working too much. Whether you have booked too many clients, you are trying to complete too many tasks or trying to fit in too many extras, for whatever reason you are letting yourself work too much and let it take over your life. Now let’s be clear, burnout isn’t just a little phrase which business owners use when they’re feeling a bit tired – it can make you mentally and physically ill and you want to prevent this at all costs. Running a perfect, no flaws business is not worth your health. You need to give yourself permission to have a break and get yourself better. But how can you take a break when you have work to do? It’s your business! The bonus of being your own boss is that you can set your own schedule and arrange work around your life. If you need some time for yourself to heal and realign, you can. Speak to your clients and rearrange your workload, they will understand. Book yourself a week or two out of work in your calendar and if possible, try and get away from your work environment. I work from home so if I sit at home, I will no doubt start checking my emails or finishing little tasks whenever I walk past my laptop. And if you can’t get away, pack your work station away so there is no temptation to jump back into work. A period of rest will let you relax and take your mind of the tasks which are stopping your brain from functioning. Every creative business owner deserves time off every now and then and a burnout stage is the perfect excuse. Once you are refreshed and your mind is back to its perfect business running self, you are ready to get back to work and start it all over again! However, it is crucial that you don’t repeat the habits you had in place which caused the problem in the first place. Habits are a tricky thing to break! Write down every area of your business in your BOTB Worksheet. Be as specific as possible – don’t just write social media marketing, instead write Instagram, Twitter, Pinterest etc. When you are finished, your most colourful business areas are your main focuses! After this task, you should have an idea of which parts of your business are most important to the business and your happiness. Getting back to work should be easier with fewer focuses and you can let the other areas back in when you feel more comfortable with your workload. Ok, I’m making a confession, I can’t deal with ANYTHING without a solid plan. I swear by my bullet journal and multiple to do lists and having a plan in place makes me feel more organised and secure. Not everyone is the same as me and I do often aspire to me a more spontaneous and carefree person, but at this stage I recommend following in my steps. You know now what you need to be focusing on going forward, so how are you going to fit this into your schedule and your life? You don’t want to be going back to working those pesky 12 hour days so you must make sure everything fits in to the week you want yourself to work. Another little activity! I know, I’m a riot. But this time we are going to plan your working week in a way that will help you get the work you want done without any stress or pressure. Now for the planning. If it’s easier, choose a different colour for each business area and then mark out how you want to spend your time and on which day. Some tasks will need to be spread out over the week, such as answering emails (Admin) and some tasks you can do in batches such as scheduling social media or blog writing. Once you have completed this activity, go back to your schedule and re-assess your working week plan. You may have scheduled too many things, in which case go back to your priorities and see if there is anything you can cut down on or cut out completely. These will most likely be the tasks which help your business grow as you want to keep the business going and maintain your happiness. Maybe you have left yourself with too much spare time (is there such a thing? ), in this case you can go back to your priorities and choose another area to add in or feel free to embrace the spare time for a few weeks! Like a baby chick, you are now free to get back into the world of work. You should now be refreshed, organised and calculated so you are ready to put your burnout period behind you and carry on being a boss! After a period of time off, for me there is nothing better than having a solid plan and feeling organised and ready to go back to business and hopefully your burnout days are now behind you! Remember to stick to the plan you have made for a few weeks and give yourself space away from the desk to rest and take your mind off work. You are now in a stage of bliss – congrats! I hope the workbook has helped you re-align and get your mind back to it's amazing, business-running self!